Yad L'achim rescued Jewish mother and her three children from abusive imprisonment in Arab village, now her son has become a bar mitzvah. A moving bar mitzvah ceremony was held at Jerusalem's Western Wall on Monday; the 13-year-old boy called to the Torah for the first time was recently rescued with his family from an Arab village, where he was being raised as a Muslim. "If I told you a year ago that you would celebrate a bar mitzvah at the Western Wall, would you have believed it?" asked a social worker from the anti-missionary group Yad L'achim, speaking to the bar mitzvah boy identified only as S. while on their way to the Western Wall for the ceremony. "I would have asked you what a bar mitzvah is," responded S. honestly. "My father forbid my mother to speak with us anything about that, and I didn't even know I was Jewish." The boy's mother, identified only as R., lived a nightmare for nearly two decades in the Arab village after being entrapped in a relationship with an Arab man who demanded she convert to Islam. R. lived as a hostage, being forbidden to communicate with the women of the village, or even step foot outside of the man's home where she was held captive night and day. Finally, driven to desperation by the harsh conditions, R. found the courage to somehow make contact with Yad L'achim, a group that helps Jewish women flee abusive relationships with Arab men. In a complicated mission, most of the details of which have not yet been cleared for publishing, Yad L'achim managed to rescue R. and her three children from their captivity, transferring them to a secret and secure location. With the aid of the organization's legal advisers, R. submitted a complaint to the police against her Arab husband's violence and abuse; until he is in the hands of the authorities, R. has been granted sole custody of her children. R. further cancelled her Islamic conversion at a Rabbinic Court. She has been assigned a social worker from Yad L'achim to help her overcome her past trauma, and educators for her son and two daughters to teach them about Judaism and the Jewish mentality. 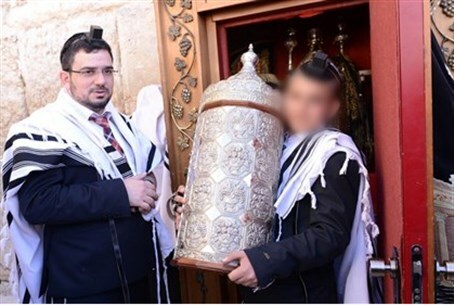 A similarly unusual bar mitzvah was held by Yad L'achim in January for the son of a Jewish woman tricked into marrying and living with an Arab man in Gaza for many years. The organization just recently helped the mother and her children escape her abusive imprisonment. Incidents of Jewish women been trapped in abusive relationships with Arab men in which they are forced to convert to Islam are not uncommon according to Yad L'achim. The group has rescued countless other women and children from abusive relationships in complex and sometimes dangerous operations. The story is usually the same: The women targeted by predators are often - though not always - from vulnerable backgrounds, and many times lured into a relationship under the initial pretense that the man in question is Jewish. After been seduced and plied with gifts and promises for the future, and isolating her from friends and relatives the Arab predator reveals his true identity, and convinces her to run away with him and convert to Islam. Once in his village and under his control, however, victims are subjected to terrible verbal, physical and sometimes sexual abuse and forbidden from making any contact with family or friends.